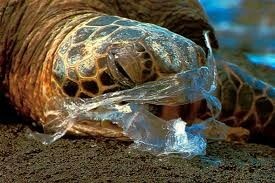 People don't realize how harmful plastic can be. But it is really harmful. Especially to sea animals. Lately in the ocean there have been large amounts of plastic. And this is dangerous because the sea animals think it's food so they eat it and it makes them feel full. So then they aren't getting the nutrients and the food they need to survive. And eventually, they die of starvation. I think people need to stop using a lot of plastic. Because when you throw away a plastic bottle, that bottle can end up in the ocean. And if the animal eats it, they starve. So my advice to you, is to use reusable containers and water bottles so our animals can be nice and healthy.